There is no reason you should live an unhappy and unsatisfactory life. How you feel about life is up to you and the choices you make. This quote, found on More Than Sayings, is a reminder to respect yourself enough to give up those things that makes you unhappy or hinders your progress. Do not sit and waste your life away. You know your goals, dreams, hopes and desires. Don't give those up to make someone else happy. 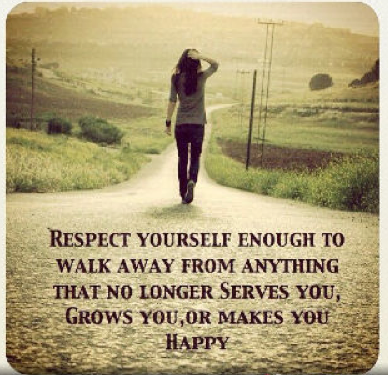 Respect yourself and see how far you go in life.